Trinity Designs: A Thank You from Andrea! Hey everyone, I just had to show you this adorable card made by my client and friend Andrea! She sent this to me as a thank you for her baby shower gift and I love it! She used the Tea Party Designer Series Paper for her top layer which was a great idea - very little stamping required here! 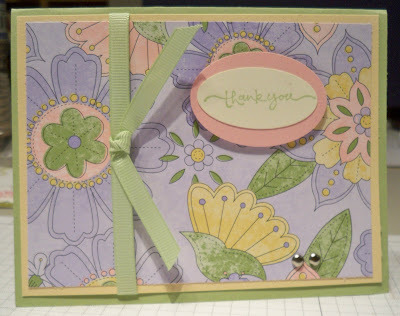 She punched out the sentiment from the Short and Sweet stamp set with the Large Oval Punch and layered it onto some Pretty in Pink cardstock punched with the Wide Oval punch. It's popped up on dimensionals for the wow factor. A little Certainly Celery Narrow Grosgrain ribbon and two Silver Brads and VOILA, beautiful card, simply done! Thanks Andrea, you made my day! By the way, did you know that one of the Stampin' Up! May specials is All of the Designer Series Paper? Yep! It's Buy 3 packs, get 1 FREE! That's a savings of up to $11.95 because all of the Specialty Designer Series paper is included in the sale. (lowest price item is the freebie) Be sure to go shopping on my website at www.robinstamps4u.stampinup.net to take advantage of the savings on our beautiful designer papers. The sale is good thru May 31st.